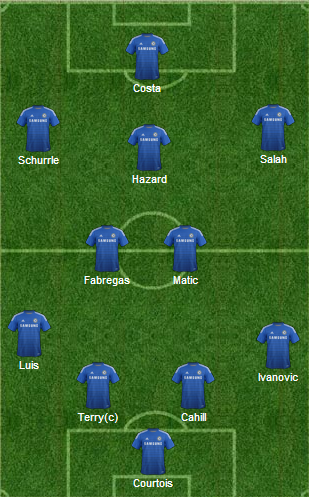 Burnley v Chelsea: Who starts tonight for the Blues? Pre season is over and after three months of waiting, Chelsea are back in the Premier League! Who do YOU think should start for Chelsea against Burnley? What has been interesting is quotes from people such as Mourinho and Pellegrini this weekend. Both have stated that players who have come back to pre season later after playing in the World Cup in Brazil are not yet ready to play 90 minutes. I just wonder if that will have a huge influence in Mourinho's selection this evening? There are players that played in Brazil but were knocked out of the group stages, some shortly afterwards, some in the latter stages of the competition, the Brazilians who were involved up to the final weekend of the competition and finally Andre Schurrle who played in the final. How many of those players would you start tonight bearing in mind we have another five days before we take on Leicester at the Bridge on Saturday? The players not involved in the World Cup will start for sure as they have had a full pre season to prepare. I also believe that the likes of Gary Cahill, Cesc Fabregas and Diego Costa will all start too. In Goal I believe that Thibaut Courtois will get the nod to start ahead of Petr Cech, signalling the focus on the future of the club and opening up all sorts of speculation regarding the future of Chelsea's record breaking and legendary shot stopper Cech. I also feel that Mourinho will give a debut to Filipe Luis at left back to give him a taste of life in the Premier League and Branislav Ivanovic will get the nod at right back ahead of Azpilicueta. But, dependant on how the manager wants to approach the game, then Azpi could start. Nemanja Matic will play alongside Fabregas in the deeper midfield positions in a partnership that already looks very promising indeed. Matic will win tackles, win the ball and feed it to Fabregas to conduct the Chelsea orchestra as he has done so in pre season. Now our attacking three could be a surprise tonight again because of Mourinho stating that certain players are not yet ready to play ninety minutes. I wouldn't count on Oscar, Willian or Ramires starting this evening but Hazard, Salah and Schurrle playing with licence to change positions but Hazard playing in the number ten role all supporting Diego Costa up front. It's also in these three areas that I can see the manager making at least two changes with Willian and Oscar being introduced in the second half. Torres to replace Costa after an hour or so. There's my starting eleven. What do you think and who would YOU start this evening?